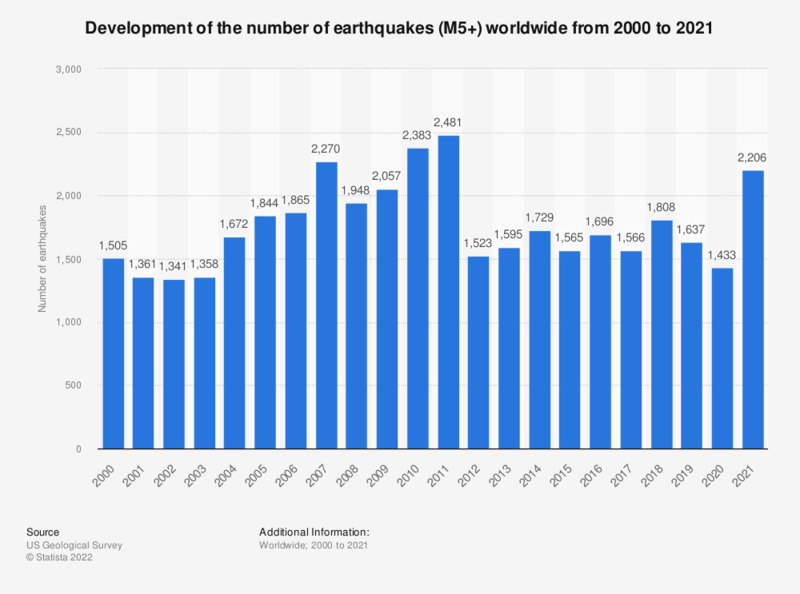 The statistic shows the numbers of earthquakes worldwide from 2000 to 2017. In 2017, a total of 1,566 earthquakes with magnitude of 5 or more were recorded worldwide. While the technology used to find the source of and record earthquakes has improved since the 20th century, the ability of scientists to predict earthquakes is still severely limited. As earthquakes happen numerous times every day, the issue for policy makers and city planners isn't if an earthquake will occur, but how powerful it will be. Large earthquakes generally result in higher death tolls in developing countries or countries where building codes are less stringent. China has suffered from a number of strong earthquakes that have resulted in extremely high death tolls. While earthquakes occur around the globe along the various tectonic plate boundaries, a significant proportion occur around the basin of the Pacific Ocean in what is referred to as the Ring of Fire due to the high degree of tectonic activity. Many of the countries in the Ring of Fire, including Japan, Chile, the United States and New Zealand, led the way in earthquake policy and science as a result. The tragic loss of life is not the only major negative effect of earthquakes, a number of earthquakes have caused billions of dollars worth of damage to infrastructure and private property. The high cost of damage in the 2011 Fukushima and Christchurch earthquakes in Japan and New Zealand respectively demonstrates that even wealthy, developed countries who are experienced in dealing with earthquakes are ill-equipped when the large earthquakes hit. Data represents earthquakes with magnitude of 5 or more.